Cut off top and bottom of zucchinis and cut zucchinis into fries, 3in x 1/4in slices. In a large bowl, mix together bread crumbs, parmesan cheese, salt, pepper, and FGF Garlic-Garlic Seasoning. 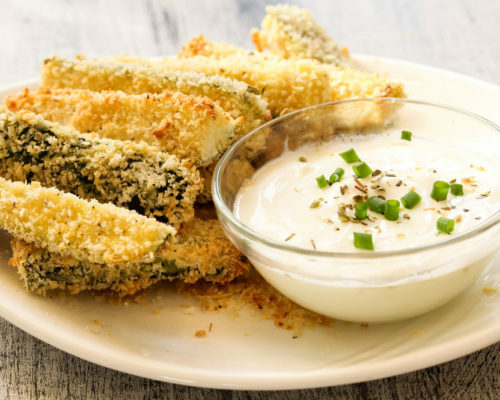 Take a zucchini fries and dip it in egg wash, then coat it in bread crumb mix, coating all sides and patting mixture onto both sides. Repeat for all fries. Transfer slices onto a large baking sheet. Bake in oven for 15-20 minutes or until chips are golden brown. In a small bowl, mix together mayonnaise/greek yogurt, lemon juice, FGF Garlic-Garlic Seasoning. Dip fries in sauce and enjoy!